Reminder: Kingsport’s drug take-back day event is tomorrow, Saturday, October 27, 2018 from 10:00 AM until 2:00 PM. Please bring any leftover, expired, or otherwise unwanted medications to the parking lot in front of Dobyns-Bennett High School for safe disposal by the Kingsport Police Department. 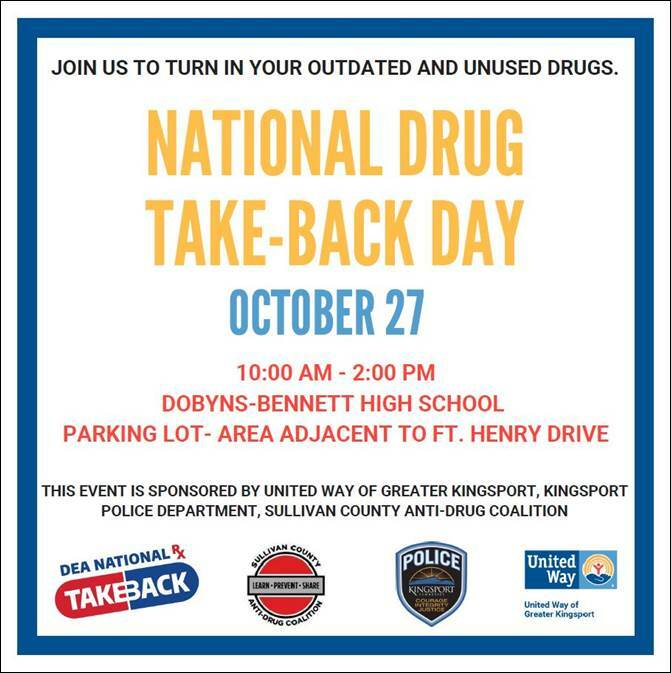 This coming Saturday, October 27, 2018 from 10:00 AM until 2:00 PM, the Kingsport Police Department will be participating in a community drug take-back event. This event will take place in the parking lot in front of Dobyns-Bennett High School, located at 1 Tribe Way, in Kingsport. This event is sponsored by the United Way of Greater Kingsport, the Kingsport Police Department, and the Sullivan County Anti-Drug Coalition. Between now and Saturday, October 27th, all area residents are encouraged to go through their medicine cabinets and inventory their medications. Now is the time to safely dispose of any leftover, expired, or otherwise unwanted medications. This community drug take-back event is open to the public and is a prime opportunity and the preferred method to safely dispose of any medications that are no longer needed. The U.S. Department of Justice Drug Enforcement Administration (DEA) sponsors two National Prescription Drug Take-Back Days each year, in April and October. National Prescription Drug Take Back Days aim to provide a safe, convenient, and responsible means of disposing of prescription drugs, while also educating the general public about the potential for abuse of medications. While the DEA does recognize these two annual days, at the Kingsport Police Department, we like to think of every day as Take-Back Day. K.P.D. has been participating in drug take-back initiatives since 2010 and installed a permanent drug collection box in the lobby of the Kingsport Justice Center, located at 200 Shelby Street in Downtown Kingsport, in 2012. Our box is accessible 24 hours-a-day, 7 days-a-week, 365 days-a-year. To date, K.P.D. has been able to safely incinerate nearly 12,000 pounds (6 tons) of leftover, unwanted, or expired medications. The goals of this program are to keep drugs off the street, prevent overdoses and accidental poisonings, and avoid environmental contamination. Drugs that can be accepted include prescription, over the counter (OTC), vitamins, herbals, supplements, and veterinary medications. Items that are not accepted through this program include needles or sharps, biohazard materials, and illegal drugs.